The Flight emissions calculator computes the amount of the CO₂ emitted to the atmosphere during a flight. The calculations are based on the flight duration and apply both to domestic and inter-continental flights. The International Panel on Climate Change (IPCC) estimated the maximal annual amount of a CO₂ that on average each of us can contribute and yet keep the global warming under reasonable control. 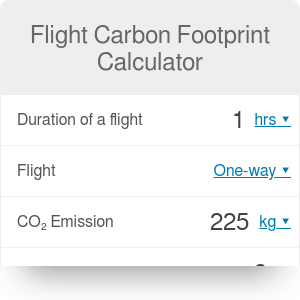 The calculator compares the amount of the CO₂ emitted during a flight to that estimate, the flight carbon footprint. Flying takes a lot of energy. A medium-sized airplane like Airbus A320 on its regular passenger route burns around 300 liters of fuel per 100 km. Once divided by the number of passengers, it's 150 if the load is full, the fuel consumption goes down to a small value of 2 liters per 100 km per passenger. That's like a car, you can check it with our Miles Per Gallon calculator. However the distances covered flying are much, much longer. One trip from the U.S. to Europe and back (say Orlando to Milan) is almost 8000 kilometers. Include the journey back, and you covered a distance that would take few months of daily home-work travel to cover. Amount of CO₂ emitted per one hour of flight per one passenger. We assume, based on the analysis of www.carbonindependent.org, that it is equal to 90 kg/hour per passenger. Seat occupancy: the previous value assumes that the airplane is full. This is rarely the case. Worldwide, on the average, the seat occupancy on a regular passenger flight is around 80%. That's the value we take. You can modify it in the advanced mode. Duration of a flight: having emissions per hour, we need the duration of the trip to compute the emission along the whole journey. Radiative forcing factor: finally, the emission takes place high in the atmosphere, and that's precisely where we don't want the CO₂ to be because of its greenhouse effect. To account for that, we include a radiative forcing factor. We take its value to be 2, based again on the analysis from www.carbonindependent.org. If you fly there and back you have to double the emission. We can do it for you. Just change the Flight option from One-way to Return. Choose your holiday destination, and you got a bunch of tonnes of the CO₂. What does it mean? To put this number in a context, let's get back to the beginning. Why do we care about the CO₂ emissions? Because of the global warming. CO₂ is a greenhouse gas meaning that once it is high in the atmosphere it works like a ceiling of the greenhouse: it lets the heat in but does not let it out. The IPCC estimated that to keep the global warming under some control, the increase of the average temperature by 2 degrees in the year 2050, emission per every person on the earth must stay below 2500 kg of the CO₂. Annually. Our daily choices impact the environment and us. If you wonder whether to travel by a car or a bike the Car vs bike calculator might help you make your mind. More of a flying fan? With Flight radiation calculator you can check how much radiation the sky traveling gives you. Flight Emissions Calculator can be embedded on your website to enrich the content you wrote and make it easier for your visitors to understand your message.